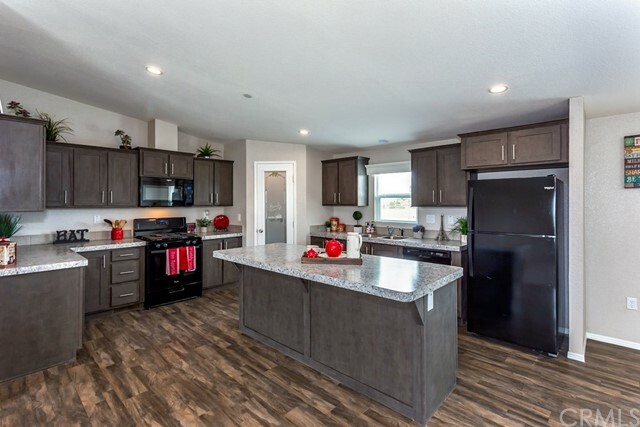 All Sky Valley homes currently listed for sale in Sky Valley as of 04/19/2019 are shown below. You can change the search criteria at any time by pressing the 'Change Search' button below. If you have any questions or you would like more information about any Sky Valley homes for sale or other Sky Valley real estate, please contact us and one of our knowledgeable Sky Valley REALTORS® would be pleased to assist you. "Beautiful! 2018 built home on a fully fenced 5 acres with gorgeous views of surrounding mountains. Spacious open floor plan with a center kitchen island, dining area all open to a large living room area. Large master bathroom has a separate soaking tub, dual vanities, plenty of storage and a connected walk in closet for your fashion collection! An additional bonus room at the back of the lot provides space for many different ideas you could come up with. This house is a must-see to appreciate the beauty of the area, and the privacy 5 acres provides." "2 Bedroom 1 bathroom home on a fully fenced 5 acres in Sky Valley. Great place to relax and enjoy the amazing mountain view. Property does need TLC. This place has lots of potential. Seller is very motivated!!! Bring in your offers. As Is Sale." "Upgraded Tiny Home (Park Model) with loft and spacious patio area overlooking the pond with mountaun views. This home is upgraded and well maintained. Furnished and ready to enjoy. Located near the pool on a corner lot. 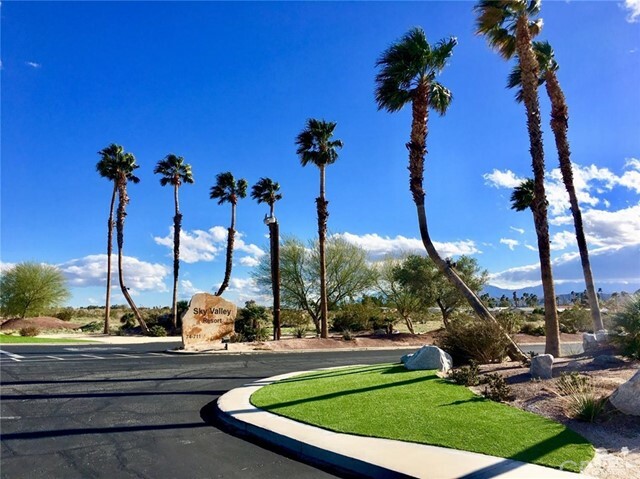 Enjoy the amazing, friendly atmosphere of Sky Valley Resort, with the healing pools and spas, chapel, mini store restaurant, ponds, ducks, swans, pickle ball, tennis, basketball, bike riding, open Desert hiking trails, and so much more!" "Excellent, best location steps to Natrual Hot Mineral water hot pools, Clubhouse. Rare chance to buy from original owners helped Sam when park was first developed to be able to acquire best prime view location! Two patios, front & back. Double 1440, three bedrooms two baths, bonus sunroom 8x 28' m/l washer dryer, cabinets-work counter/crafts~flow over den/sleeping area for guests. Great for larger family or couple for retirement with space for kids, grandkids visits. Abundant builtins, book cases, walk in closets. Sam's has to pre approve applicant. There is no short term vacation rental or renting out at all. Owner user to be present for family/ guests visit in order to use hot pools or Resert amenities, strict adherance; or family/guests Resort day pay $25 p/p weekend/holidays, $18 weekdays. 30 gas stove, chair hi toliets, family says newer roof; covered front porch, open back porch, storage house, fenced area(for dog).Cosmetic fixer upper, paint/flooring.By appointment.Won't last"
"Immaculate newer Park Model located in Friendly Sky Valley Resort. 1 bedroom plus an additional California Room for guests. Light, bright and airey, high vaulted ceilings, drywalled (no popcorn) ceiling fans, upgraded pecan flooring, solid cabinetry, large window in the bedroom that has amazing mountain and Desert views. Earth tones, Furnishing are high end solid wood designer furniture made for Park Model/Tiny Home Lifestyle. Great home or investment property. Furnishings are negotiable outside of escrow. Enjoy the healing mineral waters in the pools, tennis, ponds, pickle ball, chapel, mini store, restaraunt and much more in Desireable Sky Valley Resort. Pride of ownership in this immaculate home. Call for a showing! Owner is motivated." "Welcome to Sky Valley Resort! This community has so much to offer with community pools & spas as well as its clubhouse. This mobile home park is a hidden gem in Sky Valley. Beautiful & cozy 2 Bedroom 1 Bath home now available! Home is being offered fully furnished. Home has five overhead cabinets & plenty of storage space with its added room. Covered front deck has new carpet, home also has central heat & air. Home has grandfathered in washer & dryer hookups, which include both appliances. 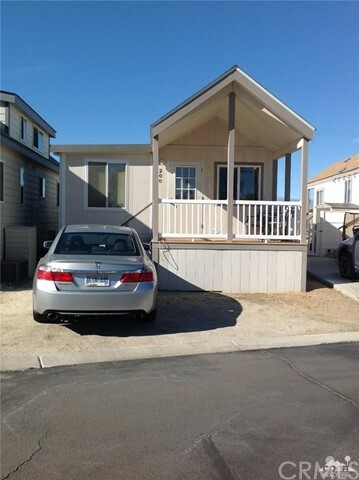 This unique home has a built storage shed in the rear & a carport to park your car! This is a must see! All offers welcome!!!"